I miss the good ol’ days. Those who have been reading me for a while (hopefully that’s you!) — or who have heard me talk about anything Pokemon related for longer than a minute — know that I have some deeply-held opinions about the health of the game. I like when Evolution-based decks are playable, especially when the Evolution is an attacker and not just a Bench-sitting Energy accelerator like Vikavolt — for example, my favorite deck ever was Empoleon / Leafeon / Dusknoir back in winter 2013-2014. I think the game is at its most boring and mindless when Basic Pokemon have a chokehold on the format. I’m also on record stating that the game has been getting better at promoting Evolution decks since the start of the Sun & Moon-era — possibly due to the mascot legendaries of this generation, Solgaleo and Lunala, being Evolutions themselves; one only needs to observe that Pokemon-GX can be Evolutions, unlike Pokemon-EX, to be convinced of that. I’ve lavished praise on cards such as Garbodor and Alolan Ninetales-GX that punish aggressive decks or enable slower strategies. This is why I’ve been so disappointed in Team Up and the new Tag Team mechanic. I’ve written recently that Tag Team Pokemon were just like Pokemon-EX, but more, and lamented that lack of creativity. After testing a lot of this new format, I have to conclude that my fears were founded. Maybe not about Tag Teams in general, but about Pikachu and Zekrom-GX in particular. With game-changing cards like Tapu Koko Prism Star and Thunder Mountain Prism Star, built-in Energy acceleration through Full Blitz, and the ability to break damage caps with Electropower, this deck can steamroll through most Evolution decks. 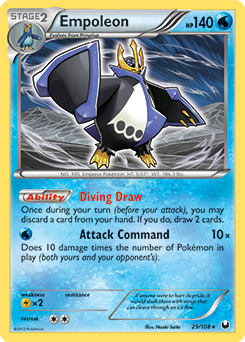 You might think that Pikachu and Zekrom-GX needs some time to use Full Blitz and this gives slower decks a chance to set up, but the deck also has access to a quick and devastating attacker in Zapdos to take KOs on evolving Basics as soon as turn one. Put it simply, it feels like we’re back in the era of Darkrai-EX and Volcanion-EX, where Stage 2 decks were far too slow to compete against Basic behemoths. I can’t overstate how frustrating this state of affairs is to me, especially since we’ll probably be stuck with Pikachu & Zekrom-GX and its support staff for a long time. I believe that Pikachu & Zekrom-GX is the best deck in the format, but, to be fair, there are counters to it. Celebi and Venusaur-GX, for example, can tank its attacks and generally end up with the upper hand. The fact that a 240 HP Basic gets countered by a 270 HP Basic is little comfort to someone concerned about the format’s health and the viability of other strategies, though. That said, I still love Stage 2 Pokemon, so in this article I want to talk about some Stage 2 decks that could still compete with Tag Team Pokemon going forward. I think this will appeal more to fans of rogue decks and undervalued strategies than to the most competitive of players; that said, I’m still a competitive player myself, and I approach every deck by looking at its potential when facing the cream of the crop. There is no doubt in my mind that the decks in this article have at least the potential to win League Cups. When you think about Stage 2 attackers in recent times, Gardevoir-GX has to be at the front of your mind. Since its release in Burning Shadows, the deck won Worlds, several Regionals, an Internationals as a partner to Zoroark-GX, and has generally been regarded as one of the best cards in the game. Gardevoir-GX’s Infinite Force is relevant against Tag Team Pokemon despite their high HP because their Energy requirements are massive. Against Pikachu & Zekrom-GX, for example, you need a total of eight Energy (seven with a Choice Band) in play to get an OHKO. With three Energy on a Pikachu & Zekrom-GX, you need four Energy and a Choice Band — one less if Alolan Ninetales-GX’s Snowy Wind put 30 damage on it earlier in the game. That’s easy to achieve if you manage to set up your board, although a Tag Bolt GX + Choice Band/Electropower will OHKO you in answer, so you need to have a response. You want to get Professor Elm’s Lecture on your first turn, using Wonder Tag if necessary. If you go second, you can use Beacon as well in order to search necessary Pokemon. Your ideal board is Alolan Vulpix, Ditto Prism Star, two Ralts and two Mudkip, although it happens rarely. A more reasonable expectation is one of each of these Pokemon. On turn two, you use Alolan Ninetales-GX’s Mysterious Guidance to get either Pokemon or Rare Candy in order to evolve your Basics. If Alolan Vulpix survived the first turn, then you evolve it into Ninetales and use Ditto to evolve into Kirlia or Marshtomp; if it didn’t, then Ditto has to evolve into Ninetales. Unless you need Gardevoir-GX immediately, you evolve into Swampert first so that its Power Draw Ability helps you get your other Pokemon. With this engine, you can quickly set up the rest of your board. Alolan Ninetales-GX also acts as a quick attacker in the beginning, putting some damage on the board with Snowy Wind. 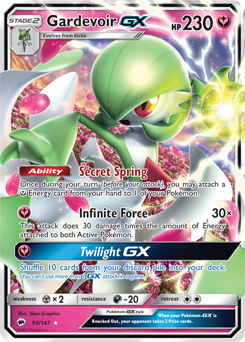 Gardevoir-GX will then act as an attacker for the rest of the game. As much as possible, you want to have three Stage 2 Pokemon in play to benefit from Super Boost Energy Prism Star‘s effect. The rest is pretty straightforward.